This was no ordinary club tour. This was the Blues Caravan 2018. At this year's Blues Caravan there was not only one exceptional young guitarist at the beginning of her career, but also two heavyweights whose reputation precedes them... This CD/ DVD release revives a unique Blues Caravan! A real live gem to experience again and again! The accompanying DVD was recorded on 27.01.2018 at Café Hahn in Koblenz! Ruf Records' dedication to the blues means that the tireless pursuit of new talent is not limited to the USA and Great Britain. Once again the label landed a coup when it signed the Croatian guitarist Vanja Sky. On this CD/ DVD she presents songs from her first studio album "Bad Penny". Many a surname ensures immediate respect in the blues scene. As the son of Luther Allison - the Chicago blues legend with whom the history of Ruf Records began in 1994 - Bernard Allison continues the family tradition and has already earned his own reputation as a world-class songwriter and performer. For this year's Blues Caravan, he can choose from an impressive repertoire that includes the classics "Born With The Blues" and "Times Are Changing", switching between genres as only a true master can. If you've ever been close to modern blues music, you know the ups and downs of Mike Zito's fascinating career. "I've wanted to be part of the Blues Caravan for a long time and I'm looking forward to it now," says Mike. "My shows are dynamic and passionate: I always try to give everything. You can expect a rock blues guitar with soulful vocals and of course my best songs". 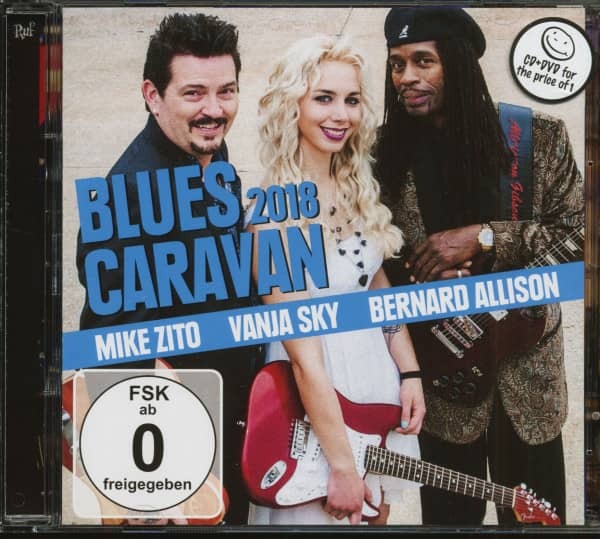 Customer evaluation for "Blues Caravan 2018 (CD & DVD)"